French inspired brand new house 5 minutes walk to main street. 3 master bed rooms and a fold out bed in the lounge suite for extra 1 or 2 persons up to 8 people. This is a full equipped house with every thing you need for a great few days away.The lounge has a chilly red lounge suite 50" TV dvd open gas fire, ducted heating, split system heating and cooling. Dinning room has a 6 seater glass top table. Kitchen is fully equipped with dishwasher, microwave and a coffee machine all crockery cutlery ect. Continental breakfast provisions provided including cereals, bread, milk, orange juice, butter, jams, vegemite, coffee, tea, sugar. The 3 bedrooms all have different styling, All linen and toweling is provided, queen size beds king doonas, electric blankets, bedside tables, lamps and clock radios. The bathroom has a corner spa, with the shower over it and a vanity. The toilet is separate with is own vanity. The back yard has 2 bench chairs a coffee table, gazebo 8 seater table and chairs large barbeque. The deck has 2 chairs and a little table. Time in after 3pm time out before 10.30. No Parties, No Smoking, No Pets. Cancellation Policy - Cancellations received 4 weeks prior to stay will receive a 50 % refund of booking. Cancellation received within 4 weeks of booking will receive no refund. Clean and comfortable place, the best yet in our experience for a wonderful few days stay. The highlight was the spacious and comfortable bedrooms. All credit to Michelle. Great position, clean and easy. The house was in great condition and provided exactly what we were after. The interior was great. Highly recommended for anyone that needs a three bedroom place. Great family house, quite street, easy to find. People easy to communicate with. Beds very comfortable. Lovely house, very comfortable with everything we needed. Outdoor area looked great but unfortunately the weather wasn't nice enough for us to try it out. Nice location and easy walk to main street. Quiet street. One bathroom with shower in middle of spa bath. The website reflected the property well. Lovely comfortable and warm home. 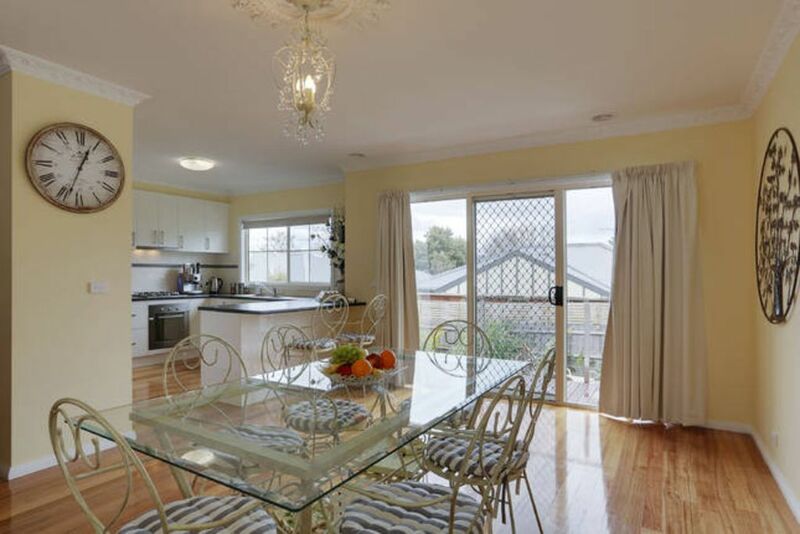 Well located and so much to do in Healesville and the surrounding area. We stayed for a week and had everything we needed. Very happy.